Posted by Brittany Bosher on Tuesday, March 20th, 2018 at 2:13pm. Quickly becoming the coolest place to hang in Palm Beach County is the booming Warehouse House District in West Palm Beach. The Warehouse District is composed of a six-building block of businesses, restaurants and things to do. Bustling with the energy of innovation, the Warehouse District is already making a splash with the locals in the community. The 85,000 square foot property that this district presides dates back to the 1920’s and has come a long way since Johnstone Capital Partners purchased the area. Originally, the property was full of “dilapidated” warehouse buildings and run down streets, a hard scene to look at for those with the idea of developing it into a buzzing hotspot neighborhood full of beauty. But, with the love, dedication and strong focus of the group, the Warehouse District is now alive with boutiques, amazing cocktail bars, impressive food finds and a plethora of outdoor fitness groups. Adding to its ingenuity and charm, the Warehouse District is divided into small quadrants each offering its own appeal. The Elizabeth Avenue Station features 19 vendors selling art, clothing, furniture, jewelry, home garden stores, pottery and other handmade items. Steam Horse Brewing, West Palm’s original tap house has recently opened, and the Black Coral Rum distillery gearing up for its debut in the near future. The Grandview Public Market section of the district spans 12,000 square feet and boasts the best in food culture, including The Corner, a Detroit-style pizza spot serving authentic, square cut slices. Another hot spot is, Grace’s Sausages & Fine Foods, which is impressively operated by a former vegetarian who only sources meat from farms that ethically raise animals. You also have Clare’s Chicken which boasts the best in southern fried classics with some international spin. Celis Produce is an artisanal produce market sells fresh and local fruits and veggies. The market is also home to the famous Rabbit Coffee Roasting Company if you need a little caffeine boost. Even if you don’t want to shop or eat, come catch a roof top yoga class or a challenging cross fit workout! 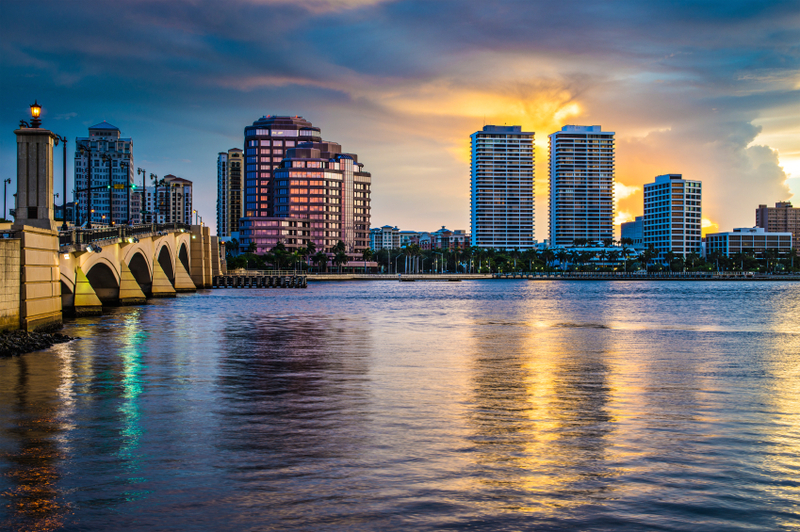 With the high population density of West Palm Beach and the high energy of its residents, this Warehouse District is sure to continue its rise up as the hottest new destination in town.